The initial stadium at Sportowa 2 St. was opened in 1964 and had drawn crowds of even 7,000 people despite its 5,000 capacity. However, having only small landfill stands, the ground needed to give way to its successor in October 2012. Construction suffered from several setbacks, but eventually the entire project was delivered in under 2 years. Two grandstands were built – main in the south and slightly smaller one on the opposite side. A training field, 140 parking bays and complete renovation of the existing club headquarters were also part of the PLN 18 million scheme (10 million came from EU funds). Opening ceremony took place in the summer of 2014, gathering 2,500 people for an exhibition game against one of Poland’s most notable clubs, Widzew. Located on the northern edge of Września’s old town, the main stadium is operational since 1927. Today it consists primarily of the new west stand, incorporated into local indoor hall opened in 2009. But the audience is elevated high above pitch level, resulting in poor view of the closer side of the field. Below spectator areas there’s room for sports facilities used by players and referees. On the east side the stadium has a more modest and older landfill stand with 4 rows, accommodating 360 people. This small stadium located in the east of Gryfice used to hold up to 2,000 people in its heyday. Those days are gone, however, as current capacity is below 700. This was caused by installation of seats across the ground and complete reconstruction of the south stand in 2010. Instead of old landfill, a new concrete structure was built with distinctive blue roof. The colour is a tribute to Sparta, largest local club created thanks to Karol Kucharski. In honour of his effort in building the club, in 2005 the municipality decided to name the stadium after him. 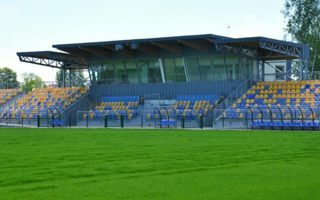 Located just several metres from the waters of the Municipal Lake, the outdated stadium in Międzychód underwent complete reconstruction in 2011-2013. Charming wooden west stand was demolished. It was then replaced with a new 400-seat concrete structure, covered with a rare wooden roof. As part of the redevelopment the field and its base layers were also relaid, while a new pavilion was built in the north, called the Sportsmen’s House. It provides recreational and professional sports infrastructure, while also giving a view of the stadium and lake. Groundbreaking on complete reconstruction of Plewiska (village in the outskirts of Poznan) main stadium took place in 2008. Within two years the site received a new main pitch, small complex of training facilities and the western grandstand for 600 people. Under the covered seats there are 5 changing rooms for teams and additional facilities for coaches.